We view the Night Market as a platform for neighbors to launch and grow their businesses, initiatives, and missions. With the Night Market attracting thousands of people from all over the region monthly, it is a great place to educate people about a cause or sell the art or handcrafted item you made in your home. 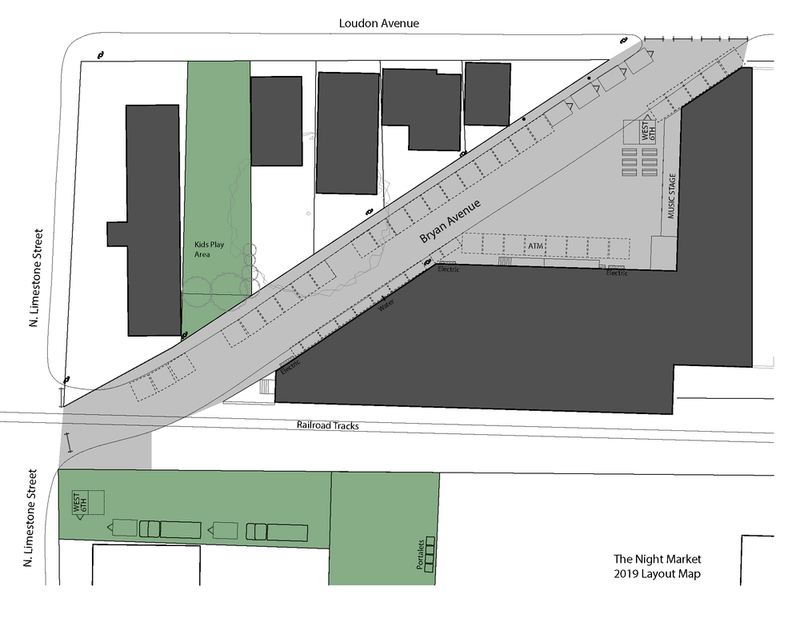 Above all, the Night Market is about making it easy for vendors to sell their goods, and easy for neighbors to enjoy public space. We look forward to hosting you this 2019 season. AM I ELIGIBLE TO BE A VENDOR? While we try to focus on vendors from the community, we do welcome folks from all over the region to vend. We do not allow national chains to vend at the market, illicit products to be sold, or the distribution of alcoholic beverages outside of the Market's sponsored beer tents. Vendors are allotted a 10 foot x 10 foot booth space, with the exception of food trucks. Vendors are responsible for bringing their own materials, including a tent, tables, lights, and chairs, etc. All vendors are required to bring their own extension cord and surge protector. Vendors are required to secure any and all permits required for their booth, as appropriate. If you are interested in vending at the Night Market, this is where you start. To become a vendor, you must fill out the vendor application, which is located at the bottom of this page. By filling out an application, you are acknowledging that you understand and agree to all terms of conditions outlined in the application. Filling out the application does not guarantee you a spot at the Night Market, nor does previous participation. Once we have received your application, we will contact you regarding availability. Vendors must apply for each Night Market, or indicate in the application which markets you are interested in for the year. There is no charge for nonprofits or charitable organizations. North & East End neighbor vendor fees are at a discounted rate. Please refer to this map for North & East End communities.